Fighting Vipers is hardly spectacular, but it should provide some good nostalgia for those who played it back in its heyday. 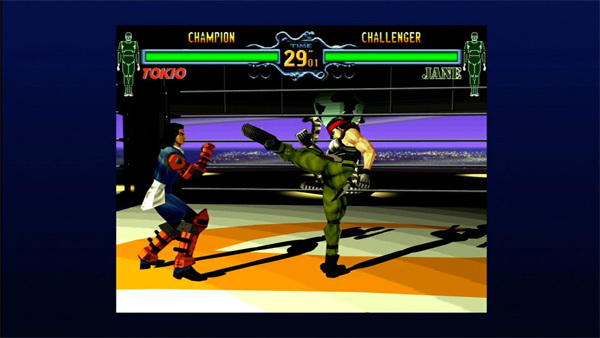 As far as SEGA’s recent rereleases of three classic fighters go, Virtua Fighter 2 is from their most famous and long-lasting fighting series, while Sonic the Fighters also has recognizable characters. Fighting Vipers is a bit different. 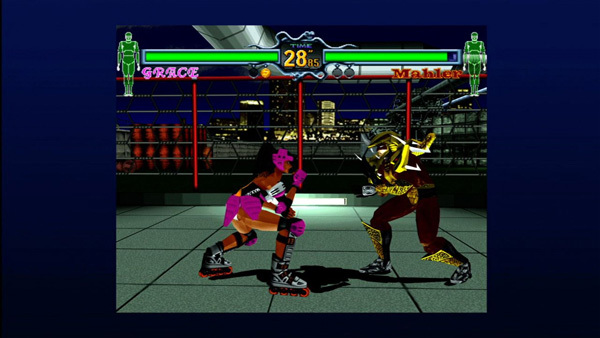 Though still a traditional fighter in most aspects, the game, originally released for arcades in 1995 and ported to the SEGA Saturn in 1996, never received any sequels, or had any characters that become icons for the genre. And while some aspects of the presentation seem pretty silly nowadays, the core game is still enjoyable. The cast of Fighting Vipers is over-the-top and screams of mid-90s design, but it’s kind of endearing in an odd way. The characters have names like Picky and Raxel, all their outfits are varying degrees of outlandish, and some have objects such as skateboards and guitars hanging from their backs. It’s certainly not a boring lineup. As far as gameplay goes, this is a conventional 3D ring fighter. Players take part in one-on-one matches and aim to either drain all of their opponent’s health before time runs out, or at least have more health than the other by the time the bell rings. Combos and special moves are the name of the game, and the actual level layouts are as basic as you can get for the most part. The backgrounds are also a bit sparse, even for the era the game was made in. There is the occasional neat touch, however, such as an airplane flying above you in one arena, but for the most part things look pretty dull. There are a few unique twists thrown into the works, though. The biggest one is the game’s armor system. What this boils down to is the fact that each of the characters has some sort of protective gear on them that can be knocked off when enough attacks hit a certain part of their body enough times (there’s a meter next to a character’s health bar to show their armor’s current strength). Once the armor is gone, the character’s defense is lowered for the rest of the match, meaning that the opponent’s attacks will do more damage. Armor being knocked off is indicated by a flashy replay cinematic that shows the moment the critical attack was struck from several alternate angles, which is a snazzy touch. However, this component doesn’t feel all that important in the grand scheme of things. It still comes down to the fact that whoever pulls off the most efficient moves will win the match. The armor being lost just speeds things up a little. There are some other aspects, too, but they’re a bit more minor. As with any fighting game, it’s possible to get tossed into the air and “juggled” a bit by enemy combos, but pressing a certain button at the right point can enable a character to reposition themselves the right way and land back on their feet quicker. Finally, as a simple bit of flair, pulling off the right type of attacks as a final move can smash your opponent through the wall at the very end of a match. This doesn’t earn you anything extra in the actual game, but achievement hunters should take note that they’ll get one for pulling this off. Online and offline play is fully supported, and while the blocky graphics still carry some charm with the high-def facelift they’ve received, the same lack of true widescreen support that Sonic the Fighters suffered from is still apparent here, with an unappealing and bland blue border taking up the left and right sides of the screen. It would have been nice if SEGA had taken the time to make this remastering take full advantage of modern TVs in this regard. Fighting Vipers is hardly spectacular, but it should provide some good nostalgia for those who played it back in its heyday, and its cheap asking price of $5 is also nice. Fighting fans will get the most out of it, as will diehard SEGA fans who want to try everything the company has ever put out. This review is based on an XBOX 360 copy of the game that we received for review purposes.